Gayathri Vasudevan is a doctorate in Development Studies, with over 23 years of consistent work for the less privileged. 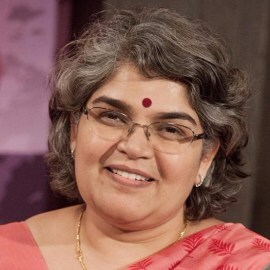 A research scholar on gender and labour issues, she spent early years of her career exploring rural India and consulting with organisations like UNDP, UNICEF, NORAD, Work Bank. She was associated with International Labour Organisation for eight years before cofounding LabourNet Services in 2006 with a vision to enable livelihoods and enhance quality of life through Education, Employability and Entrepreneurship. Her untiring efforts have already touched half a million lives, empowering men and women to earn a decent living and become entrepreneurs. Gayathri has held several advisory posts in the Government and presently, is member of Recognition of Prior Learning Projects, MoLE, Tailoring Advisory Board-Raymond, CII - National Skills Committee & National Sports Committee, Periyar Technology Business Incubator (Periyar TBI). She has more than 30 publications in the areas of labour & employment and gender issues to her credit. She has won numerous awards in the last decade for her exemplary work in labour issues and is one of 53 most Powerful Women in Business in India.